Yim is 12-years-old, she was diagnosed with heart disease when she was only one and has survived on medication ever since. Yim was suffering from a congenital heart defect known as Ventricular Septal Defect (VSD) which is a hole in-between the 2 chambers of her heart. This left her with shortness of breath, delayed growth and a shorter life expectancy. Both of Yim’s parents are currently unemployed and they, like many Cambodians, wouldn’t be able to pay for her heart surgery overseas. So they patiently wait hoping for an opportunity for surgery in Cambodia. 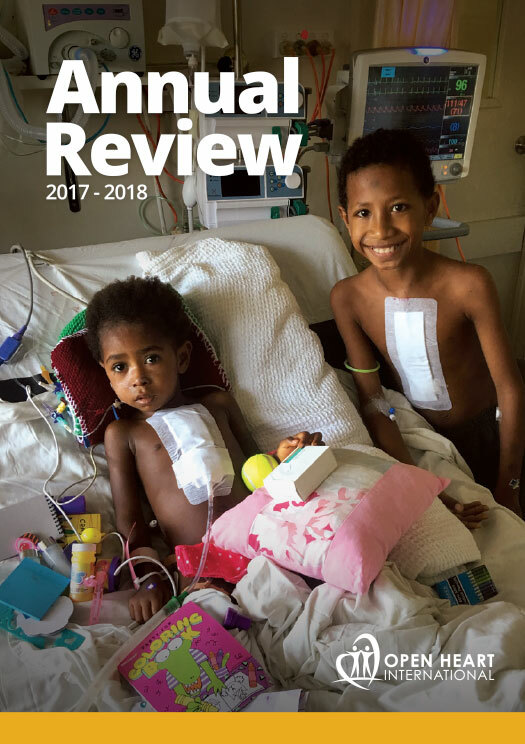 Angkor Hospital for Children is one of two public paediatric hospitals in Cambodia and has more than 1,500 kids on the waiting list for heart surgery. Thanks to the volunteer OHI team, Yim can now live a normal life. She has been one of the 11 lucky children to receive free life transforming heart surgery so far this week. Before Yim’s operation, her parents said they were very scared and felt helpless for her condition. Now, after her surgery they said they were very grateful to OHI. OHI volunteer Physiotherapist, Cath Mellor, is helping restore Yim to good health and is certainly bringing her lots of post-op happiness. Physiotherapy is really important after open heart surgery as the lungs are affected by both the anaesthetic and the incision made to the chest. 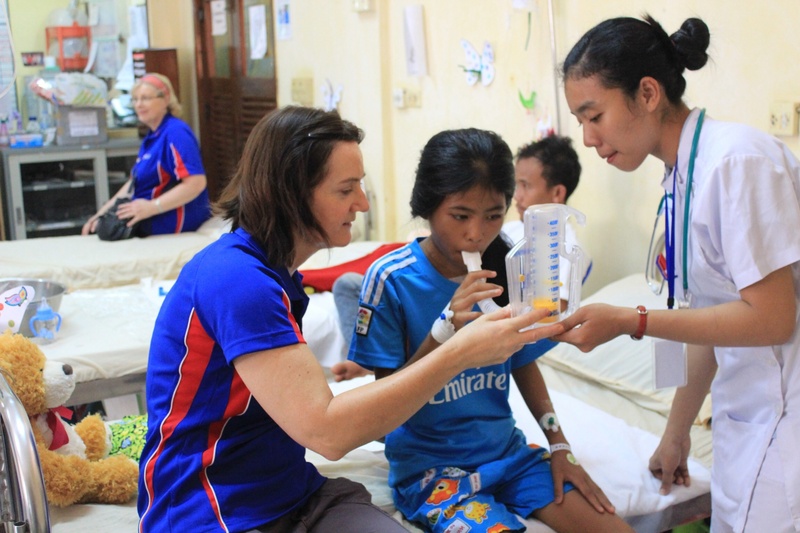 Back in Australia Cath is an Adult Cardio-Respiratory Physiotherapist at St Vincent’s Private Hospital in Sydney. She is a long-time OHI volunteer visiting countries like Vietnam and Myanmar 4 times. 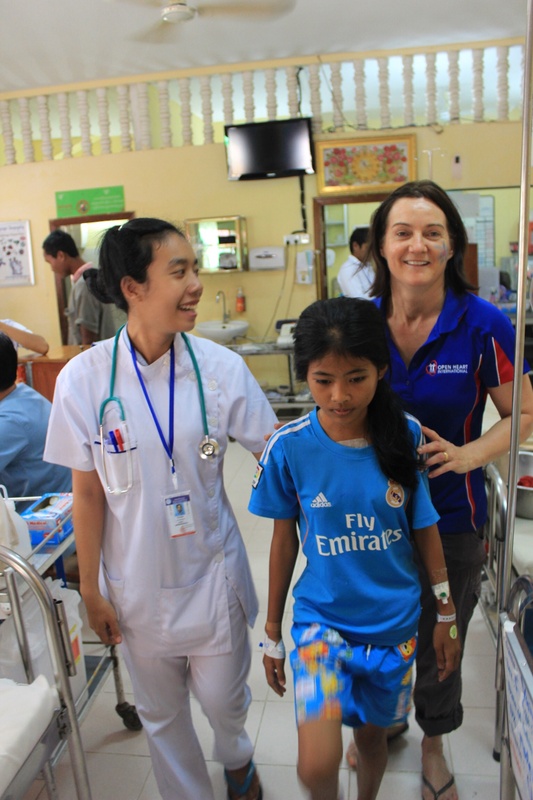 This is her second trip to Cambodia and while she normally works with adults, she enjoys Paediatric Physiotherapy just as much. “I find the kids more receptive to physiotherapy than adults” she said.